If you are a reader of YA and you don't know who Sarah Dessen is then I am embarrassed for you. Dessen has written nine books that have delved into the dysfunctional families, boy dilemmas and the strength of friendship...she's one talented lady. I'm not a pushy person. In fact, I tend to be more of a doormat, usually to my detriment. But when it comes to Friday Night Lights, I am a zealot. If it was a religion---and for me it kind of is---I would be going from door to door with pamphlets, trying to convert people. 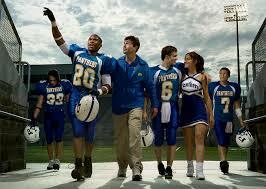 Again and again, when I try to tell people how amazing this show is, they say, "I don't like football." Neither do I. But FNL isn't about football. It's about people, and relationships, and a small town and a high school and just, well, the WORLD. The characters are so well drawn, you feel like they are real people. Watching it is like reading a really good book, with these interwoven subplots and tiny nuances and moments that just give you chills or make you cry. Sometimes both. OFTEN both. Can't wait for the premiere this week! The first episode is extremely powerful for most but in some cases (like Sarah's babysitter) you need to watch a little more to realise the wonder that is FNL. A big thank you to Sarah for taking the time to contribute a piece, she's supremely lovely, kind and generous and I can't thank her enough. Adele, I have to say... you're actually convincing me to try out FNL. And I'm the girl who swore up and down she wouldn't add one more TV show to her too-full lineup... Congrats on a job well done! A few months ago I saw an old high school friend who I had not seen in a few years. She was talking about FNL and how she even had a Riggins Rally Girl t-shirt. She was so passionate about the show. it was then I decided to give the show a go. Normally I would not have given much stock in what my friend said we don't have the same taste in everything. But because Sarah Dessen had raved about it I decided to watch. I got the first season from the library and was sucked in fast. At first I loved Matt, but then come second season and episode There Goes the Neighborhood. Oh my gosh I fell hard for Tim, I made sure and watched that episode twice. I am still waiting for season three to become available from the Library (only 2 in front of me now). So thank you thank you Sarah I will always be grateful for you converting me. YES! So glad you're a Tim Riggins girl too, Sarah. Those bad boys are just ir-res-istible.